The Classical and Romantic are often convenient labels applied to certain discourses of the cultural arts. When hearing the terms “classical” and “romantic,” those who recall something of their university days will think of definite periods of time: the Romantics — in art, music and literature — of the early 19th century; and the Classical period of the Greeks and its revival in the 18th century. But beyond their designation of specific historical periods, the romantic and classical are modes of aesthetic production and experience that can be applied to art of varying time periods, including our own. In many ways “classical” and “romantic” have lost most of their original meaning. In lay terminology the classical in film, literature or music is simply those works that are well-established heavyweights: Hitchcock and Fellini, Dickens and Bronte, Mozart and Beethoven. In the vernacular, romantic has been reduced to describing moments of amorous feelings. Even in histories of art, “classical” and “romantic” are often described as isolated movements, rather than omnipresent modes of expression that occur in art throughout the ages. Which is why it will be surprising to many to talk about the classical or romantic tradition in regards to abstract, neo-modernist painting. David Maestas’ current show of abstractions at Palmers Gallery is a demonstration of the perpetual reality of classical and romantic aesthetics in art — here demonstrated in purely neo-modern works without subject or iconography. The classical is not specific to Michelangelo, nor did the romantic end with Turner. It might be said that there is no period of art that can escape the fundamental tradition of the classical or a period of history where a sublime element best termed “romantic” is not present. The classical tradition stems from the early Greeks, who in their philosophy and art were motivated by rational thought and a search for balance and order. Manifest in their temples, sculpture and design elements, the Greek aesthetic emphasized composition, balance, contrast, harmony, structure, naturalism, order, symmetry, logic, perspective. Art was not a new form of expression for the Greeks but by them was made logical. Artists and philosophers have revived the essence of the classical when it was most essential to the development of their own society. Classical periods, such as the Renaissance, the Baroque, and the Neo-Classicism of the French Revolution, are concentrated moments of the traditionally classical. These periods tend to mimic the Greek, whether in the sculpture of the Renaissance, or the penchant for columns and pediments in Neo-Classical architecture. But the idea of the classical, the logical aesthetic of the Greeks, resonates through art in more than just surface imitation. The Modernists, although apparently departing from the classical in distorted works like Picasso’s, “Les Demoiselles des Avignon,” were, in fact, experimenting with the classical for its own sake. Although their work was a departure from the academic tradition, the modern trajectory was, in general, a study of what might be done by taking the strict principles of the classical to their limits. From the early years, the Impressionists, for example, followed classical principles of color and how it reacted to light. There was nothing quixotic about this purely rational approach. The Cubists’ study of space and depth was very much in the classical mode and it might be said that the classical is at the foundation of much of the genius of the Modernist movements. Yet to talk of Maestas’ abstract works — which owe much to the Abstract Expressionists — as classical would still be a stretch for many. Most viewers would not ascribe the structure, logic and order of many of his works, with the balance of those aesthetics so refined by the Greeks. Many of his compositions, however, are true to the essence of classical purity. They are articulated using colors that support one another, geometry that is harmonious, and contrasts that are bold. These canvases bear a pure, classical aesthetic and formal reality as valid as the classicism of a Titian. 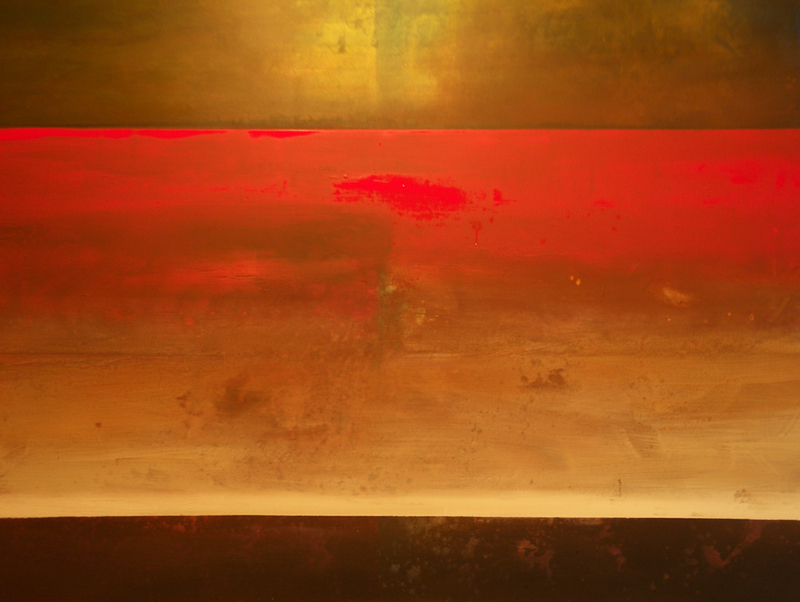 In “Rojo Tierra Amarilla,” a purely abstract painting, fundamental classical elements cannot be denied. It is inconsequential that we find no reference to Homer or Hermes; this is a superlative example of the classical element in the abstract genre. The painting “functions” holistically. The artist creates a balanced structure focusing on contrasts of geometry and color; an even, broad, delineated, horizontal band of dark supports the contrasting white above it, which builds into a vivid gradation of red, segmented by a band above with tones of blue. Like a classical building where the column supports the entablature that in turn supports the pediment, all is logical and the elements work together, forming a harmonious whole. Without any trace of representation, this piece by Maestas, like others in the exhibition, is an exercise in pure rational form. 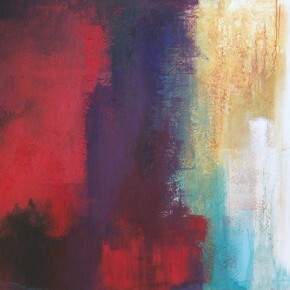 Although the artist is equivocal as to what exactly propels him in his canvases, they are well-structured compositions. Ever since the Venetian school of color exploded at the end of the Renaissance, another vein of expression, a companion to the classical, has provided artists with endless inspiration. This sister-school was a departure from the venerated aesthetics of the classical, but not a break. In its nascent stages it led to a lengthy historical debate between camps siding either with Rubens or with Poussin. The argument consumed the various Academies, who either fought for the new aesthetics of freedom of color and freer use of design elements, supported and exemplified by the school of Rubens, or the more structured design-oriented, classical establishment schools whose ideal was Raphael, and was then personified in Poussin. The departure seen in Rubens was not born from a tabula rasa; it used standard aesthetic tools, but with a freer form and ideology. The Rubens school led to what would become known as the “Romantic,” a mode of thought and expression that was highly appealing to many free-thinking, poetic and philosophic artists. They embraced the aesthetics of lucid and inventive color, indefinable volume, intangible form, infinite depth, emotive intensity, and, above all, references to the sublime — the ultimate transcendence of the physical into the limitlessness of the cognition of the imagination. These elements do not adhere to structure or logic, but compliment the classical and provide a dynamic transition into alternate paths of expression. Contrasted to his more structured work, Maestas’ “Garden Tones” exemplifies this departure from the strict classical model. His paintings in this vein appear to depart from basic structured elements yet are never disenfranchised from them. In these works the artist seems to be liberated. In “Garden Tones,” as the name suggests, a loose, fluid approach exploring painterly qualities appears to have superseded rational and logical structures. 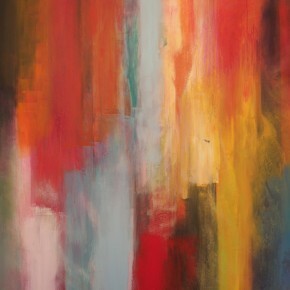 Bold colors, such as the vibrant red, blend into pinks and peaches, and in places seems to flow from the canvas. A sense of balance is offset by a definite dark, loosely painted segment on one side and a much lighter hue on the other, loosing the focus on formal structural integrity. 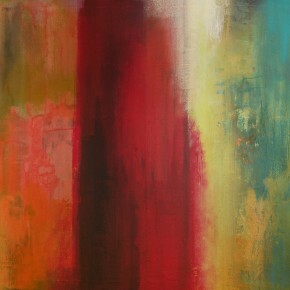 Colors, which neither contrast nor balance, flow and blend into one another as freely painted vertical bands. The contrasts in color are subtle or absent, the composition unbalanced, and in general, more irrational. However the result is not chaotic, merely quixotic. The artist takes liberties; he seems to depart from absolutes of logic and order towards the ethereal. In “Garden Tones” one may find, like in a Whistler nocturne, a notion of transcendence, looking beyond physical structure and balance toward the sublime. Or in “Rojo Tierra Amarilla,” the mind is led to a more logical reading of the canvas, opening a door to rational thinking. The fine examples of David Maestas’ work at Palmers Gallery show us that whether a work is executed in the Renaissance, Romantic or Neo-Modern periods, art is always grounded upon solid aesthetic foundations. When one looks beyond surface notions of what a “Classical” painting or “Romantic” painting contain, they can see that these aesthetic principals can be found in all art, including Neo-Modernist abstractions like Maestas’. David Maestas’ exhibit of abstract works is on exhibit at Palmers Gallery (378 W. 300 South # 3, Salt Lake City, (801) 359-4632) through June 12. Ehren Clark studied art history at both the University of Utah and the University of Reading in the UK. He is now a professional writer living in Salt Lake City. Canning Culture: Shelf Life paints a portrait of a community, one jar at a time. 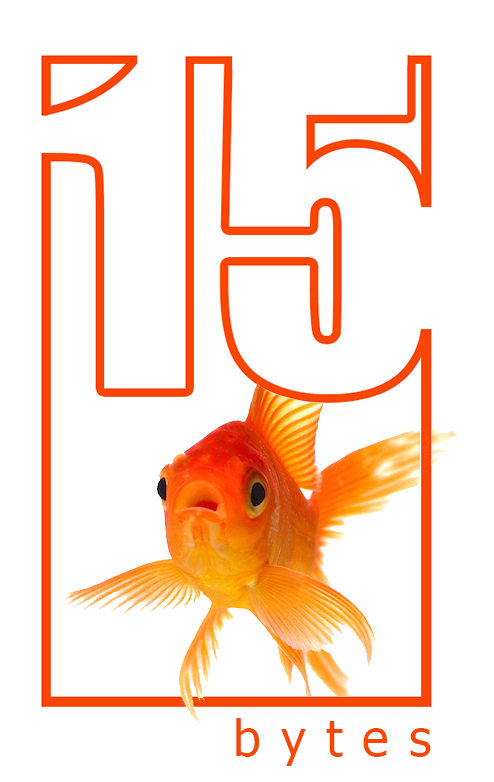 Support 15 Bytes’ coverage of the Utah art scene for the next 6 months. You can set up a recurring donation. It will be charged automatically to your credit card every month and will be so small you want even feel it, but it will help make big changes in Utah's art community. To learn how you can get your own listing in our Artist Directories click here. Artists of Utah/15 Bytes is a 501 (c) 3 tax-exempt non-profit.